Taking your cat along with you on your travels is a great idea, particularly for your Instagram and YouTube audiences. Who wouldn’t love to see you and your cat on the road? So cute! Here are some pet-friendly tips to hide your cat and what to do about any messes. Sometimes, the trip you planned is not the one you have. Let’s look at some basics before you hide your cat in a hotel room. There are actually some pet-friendly and cat-friendly hotel chains. Did you know that? And a lot of them have a cheap pet deposit or, at the very least, offer comfortable accommodation for your furry friend. The truth is, hotel chains really only block pet traveling because of the hard-to-remove-completely pet dander for people with allergies and because they cannot control who will have a well-behaved cat and who will have one that leaves a mess on the floor everywhere. Even if you use soap and water, you have to use other chemicals to remove the smell at a level that another feline can’t smell it. More on this later. That is why it’s a good idea to use a hotel chain that is already very pet-friendly. There are a lot of them! All of these hotel chains are cat-friendly and some of them offer a very low pet deposit or special comforts and treats for your kitty. We all have to help those who are allergic to our friends. 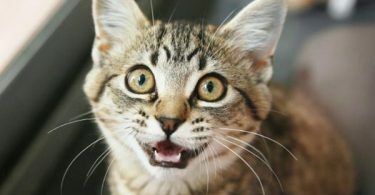 Often, they’re not allergic to the cat itself, but to the medication it receives. Any cat vaccinations or medication at all can make an allergy much, much worse. You will need to clean carefully before you leave your hotel room. We’ve offered an entire section on “responsible clean-up” below. According to Travel with Kitties, cats like to carry themselves to all sorts of places. 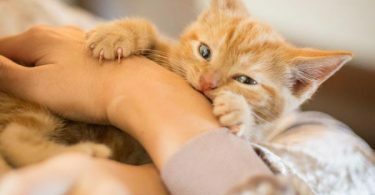 But flying, being carried in a pet carrier, riding in a car, or staying in a hotel are all frightening prospects for our little kitty friends. You should expect stress and a lot of it. 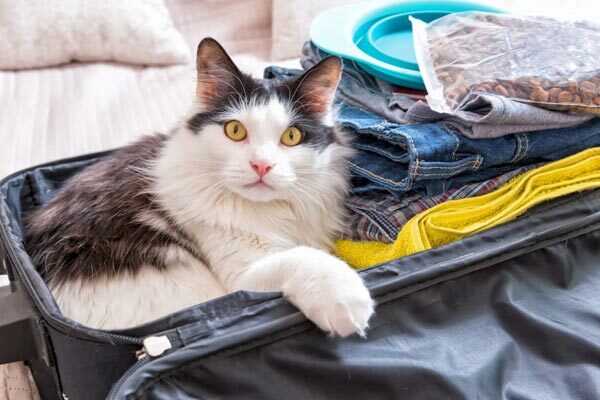 One of the ways you can reduce stress is to travel with an easygoing cat, to begin with. Cats with nice, easygoing natures will easily get along with everybody and will not howl mournfull if you lock them in the bathroom while you work on your laptop at the desk in your hotel room. Cats absolutely never use the bathroom at the airport, on a plane, in a car, in their pet carrier, or in any other kind of transit situation. The travel is very hard on them and it is very stressful. According to GlobalAnimal, they will hold it for 15 hours if they have to. Make sure that you have a harness attached to kitty so that you can let him or her out for a potty break in a nice park somewhere. You really don’t want to lose your cat and then wonder if it will ever return to you. The truth is, in a new and strange environment, it may not be able to find its way back to you. You must microchip your kitty. That way, if someone finds her or him, you can quickly identify them in the pet shelter. Make sure your information is always up-to-date on their chip so that the shelter owners can find you and contact you about your lost cat. If your cat is accustomed to sleeping with you on your bed, they will probably take a hotel room very badly. Hiding your cat is ten times worse if they won’t stay quietly and happily in the bathroom. A wheelchair-accessible room will have a much larger bathroom, which will feel better to your feline friend. The extra space will also allow you to place their food and litter box on opposite ends of the large bathroom from each other, something which all animals care about deeply. A larger bathroom will also allow you to spread your own stuff out on the counter without worrying all of the time if kitty will make a game out of knocking it all to the floor. Just remember to keep perfume, cologne, and other unbreakables in a zippered bag at the back of the counter or on a higher shelf. If that stuff gets knocked down and smashed, it will overwhelm kitty (and your room deposit) with the smell. You should place the litter box beside the toilet on the side away from the bathtub. This keeps kitty from walking over moisture and then over litter and clumping it in their paws and everywhere else. Very messy. Place their food dish on the opposite side of the bathroom, usually beside the door and under the lavatory. Keep the toilet seat down at all times (so they don’t drink something with a cleaning chemical in it) and keep their water dish beside their food. Just in case something happens, you need to know where to go to have your pet fixed. Vet Street tells us to look at veterinary clinics (particularly 24-hour ones) in your destination city and make note of the emergency clinics for pets, as well. At some point, you will want to go out to a nice restaurant or go see a show or attend a business conference. You don’t want kitty to meow and annoy the other guests and get in trouble with the hotel. Look up pet sitters in your local area (there’s an app for that) and ask them to be on-call during the week or weekend you will be in their city. Make sure you bring old, unwashed towels from home. They can be your towels or your kitty’s towels, but don’t wash them beforehand. This will make kitty feel at home while they are sleeping and will put familiar scents in a grossly unfamiliar environment. Bring one towel per night to reinforce the scent from home and replace one per night. Get a small, disposable spray bottle, fill it one-third of the way with apple cider vinegar (the cheap stuff) from the store and the rest of the way up with water. Shake it up to mix and spray this all over the bathroom that kitty has been staying in. Any pet spraying, urinating, odors, or vet medication rub-off will be demolished. The odors will be demolished even at the level that pets can smell them. Perfect solution. Easy peasy. Tip housekeeping and the concierge services generously. This will foster goodwill toward other pet owners and will make the task of cleaning up after kitty so much easier (in addition to what you do yourself, of course). This makes it possible for other pet owners to continue traveling with their own furry friends, as well. To prevent kitty from escaping when housekeeping enters, use the “Do Not Disturb” signs (and “Pet in Room” sign, if you’re staying at a pet-friendly hotel like the ones listed above). If you are inside the room yourself, deadbolt the room to prevent entry of any type. This will make sure that kitty doesn’t quickly march out of the room while you’re not looking. There are certain things you can do to lower the stress levels of your cat. While in transit, at the hotel, if they start freaking out, stress levels in a cat matter. Also, you can make your kitty feel more at home if you first take care of these things before you get to work in your room. Never allow kitty to roam around the hotel room itself. According to Petcha, there are so many places where they can get stuck, get out of reach, or hide from you. Always go into the bathroom, close the door, and then let kitty out of the pet carrier. Have you ever wanted to know how good your cat (and other animals) can be at hiding? This is a great YouTube video on how to get your cat out from a difficult place without getting scratched in the process. Among your kitty’s things, you should have several old toothbrushes. Get one out and set kitty on the bathroom counter. Use the old toothbrush to groom and comb your cat. This is very soothing for them because it feels like when their mother’s rough tongue used to groom them. It is very soothing for all cats, no matter the breed. If your cat has long hair, then use a small natural-bristle brush for human hair. This will help prevent additional shedding while also being long and strong enough to get that delicious, soothing grooming behavior down for your cat. If your kitty gets stressed out, escapes from the bathroom, or is just generally in a miserable state, go down to the nearest grocery store and ask them for a small cardboard box. All cats love cardboard boxes and if you get several, you can set them up in different configurations under the lavatory in the bathroom. You will always find your kitty in one of them. There are also collapsible storage boxes, like plastic and cloth and so on, which have hard sides. According to Cats Going Places, you can get these from any craft or office supply store or from Wal-mart and other large superstores. You can collapse these and carry them with you down the side of your luggage. If there are blankets and toys that your cat always uses, bring them from home. However, you should keep them sealed in a plastic bag while on the plane or in a moving car with people. You never know who may be allergic to your cat. You want to keep pet dander as far away from them as possible. Another great option is to buy pet-sized pop-up tents or spiral play tunnels for your cat. Make sure kitty likes them at home before you bring them along for travel. This is a great way to give your cat a nice hiding place away from the weird new surroundings and it is something familiar and it smells like you and kitty. These are great options for pet owners, both at home and on a travel vacation. 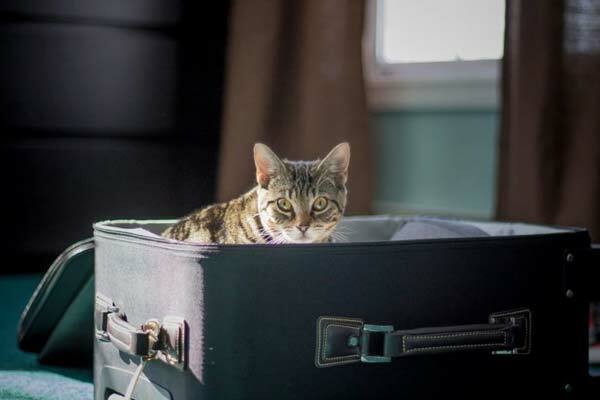 You are now completely and perfectly ready for hiding your cat in any hotel room. Remember to have a small dish and bottled water on hand, just in case. Take all bathroom breaks in a nice park while you’re still in transit. As for the hotel room, just make sure you clean and spray with your vinegar water afterward to break down the pet odor. Tip generously. And, give your furry feline a pet from us.